German politicians, still reeling from the large-scale rightwing riots in Chemnitz on Sunday and Monday, have two more issues to worry about. Firstly, the rightwing political groups of Pegida and AfD have planned fresh protests in Chemnitz for the coming days and all expectations are that the number of participants will top 10,000 for those. Secondly, it would appear that one of the causes for so many people showing up (Monday saw 6,000 rightwing protesters) was because the arrest warrant of the Saturday night brawl which led to the protests was leaked to a rightwing website by a police officer. As we’ve informed you, the protests were a result of a stabbing which took place during a city festival over the weekend where a German man (35 years old) was stabbed to death by a group of Iraqi and Syrian youngsters (aged 22 and 23 respectively) after an alleged sexual assault by the refugees on a German woman though police has not confirmed the last part. The subsequent police report of the incident, which featured the names of the suspects and their nationality appears to have been leaked to a far-right website hosted by neo-nazi sympathizers. 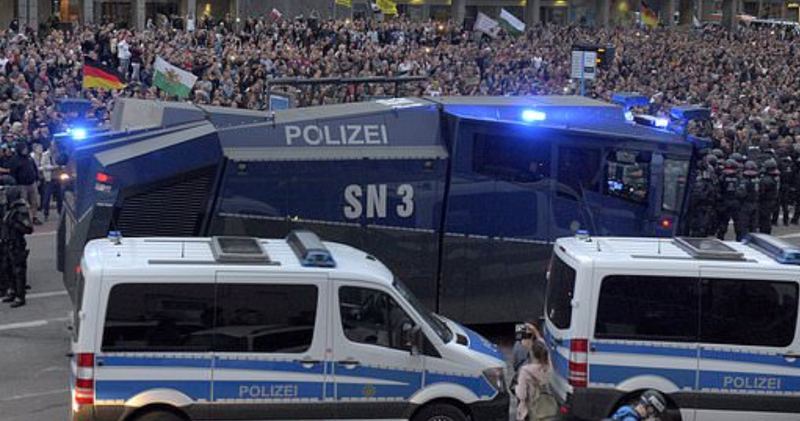 They sent it through to Pegida founder Mr. Lutz Bachmann who posted it and called for right-wing supporters to march through Chemnitz on Monday. 6,000 people showed up, far outnumbering the leftwing Antifa protesters who counted between 1,000 and 1,500. Also, the police, who had called in reinforcements from Dresden and Leipzig beforehand was no match as they were only 600. The arrest warrant for the Iraqi suspect revealed details of the number of stab wounds (5) as well as the full names of suspects, the victim, witnesses and the judge. It also contained the Iraqi's address. Meanwhile, the opposition leftwing Green party accused interior minister Mr. Horst Seehofer of fanning anti-migrant sentiment in recent months as he prepares to shift the ruling CDU to the right and said he should think about resigning after the violence. Leakers are the best way of fighting back. Keep up the good work. The narrative is shifting and not even dire (((censorship))) on youtube and elsewhere can stop it. The Germans will prevail, but a lot of invaders are going to either fall in line, want to go back to the deserts, or die in the process. At least some police are also on board with stopping the invasion. Keep up the good work helping save your country! Gas the savages BUT protect your donkeys! THERE ARE NO WINNERS HERE. THIS WHOLE SITUATION WAS ORCHESTRATED FROM THE GET GO. THIS IS EXACTLY WHAT THEY WANTED, KILLING EACH OTHER, THATS WHY THEY FORCED THE MIGRATION. 'THEY' ARE ALL MUNCHING POPCORN PLACING THEIR BETS ALL QUITE ENTERTAINED AT THE MISERY INFLICTED. CAMELS CANT FIT THROUGH THE EYE OF A NEEDLE.